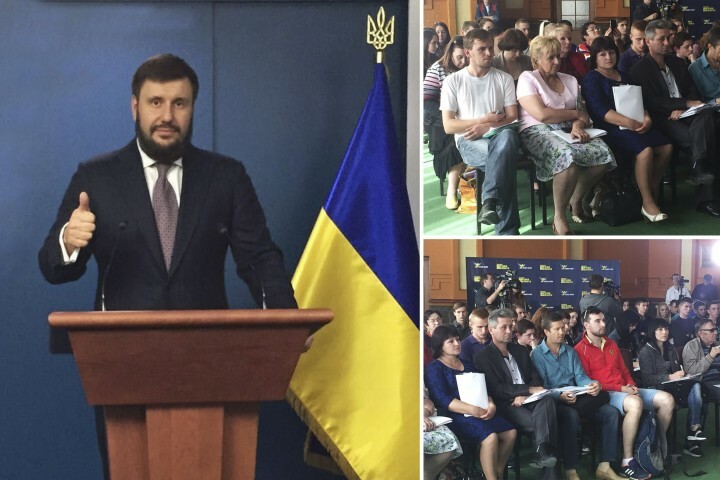 In Kirovograd it was presented ideas on Ukraine's recovery from crisis ⋆ News ⋆ Official website for Oleksandr Klymenko. 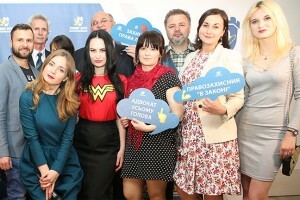 On June 8, in Kirovograd it was carried out a forum of entrepreneurs «Fair taxes – Uspishna Kraina», where they were discussing working out new fair Tax Code. During the event, which was organized by the “Uspіshna Kraina” party, the participants were debating on main problems of Ukrainian business in a dialogue format. They emphasized the permanent degradation of the situation on the market, lack of support from above, increasing of tax pressure, bankruptcies and “withdrawal into the shadows” that accompany Ukrainian entrepreneurs. At the same time, authorities not only do not resolve problems, but try to divert people’s attention from important issues. “What’s the difference between lack of workplaces in Kirovograd, Elisavetgrad and Kropivnitskogo? Entrepreneurs have to close their business due to high taxes, our children cannot get qualitative education in schools?”, – Oleksandr Klymenko, the leader of the «Uspishna Kraina» party, emphasized during his communication with entrepreneurs. During his speech, he told both about solving problems of entrepreneurs, and injustice, which prevails in the country: “Ukrainians, who want to work honestly, are forced to close their business or try to avoid paying backbreaking taxes. The oligarchs are feeling good. They are freely withdrawing capital to offshores, minimizing taxes and are still unpunished”. In order to block the outflow of capital to the offshores, Klymenko calls on renewal of action of the law on transfer pricing, which was adopted by his team back in 2013. Entrepreneurs supported him. “The Tax Code should be created on the principles of benefit from compliance with laws: we must introduce a tax on offshore companies that would not create favourable conditions for withdrawing funds from Ukraine. I really like the idea of creating a new Tax Code from ordinary people”, – Elena (local entrepreneur) expressed her opinion. Residents of Kirovograd are sure that tax decentralization (tax of local business should be remained in local budgets) will contribute to development of the region. Klymenko noted that effective decentralization requires redistribution of the revenues in budget and increasing the share of local budgets up to 70 -80%. “Only in such case tax decentralization will create favourable conditions for the development of local infrastructure and, most importantly, it will eliminate corruption schemes in the process of fund’s allocation. Money of Ukrainian taxpayers should not flow away to Panama. It should operate for the good of community. I have always said it is important that each person can see, where the paid taxes are gone”, – the politician said. Participants of the forum were looking for answers on more global issues: reduction of tariffs, price of products, creation of workplaces. “Is it fair that food prices in Ukraine are extremely expensive despite its huge agricultural potential? Why should pensioner choose between bread and vegetables in supermarket? Ukraine – is a country with an amazing potential in agriculture area. However, producers are suppressed by ineffective tax policies “, – Klymenko said. The politician offered to reduce the VAT rate for producers in agricultural area to 5% and to leave the possibility to use special tax regime, to introduce new incentives for small and medium enterprises in agriculture. During active dialogue on the forum, it was also discussed the moratorium on investigation of business and liquidation of the tax police. Those, who came to the forum in Kirovograd, are sure that all the initiatives and suggestions should be at the legislative level via adopting a new Tax Code. They noted that almost everything should be reviewed: general scheme of the VAT return, tax on personal income under the conditions declining purchasing power of population, operation of public services, etc. In its part, Klymenko assured that the “Uspіshna Kraina” will press for adoption of business initiatives: “I always take responsibility for my words. We are not only working out a fair Tax Code, but also we are going to achieve its adoption. This is only a tiny part of our plans, which are put in agenda of the “Uspishna Kraina” party. This is only a tiny part of our great struggle for justice. Nowadays, authorities are doing everything to stop us. Our forums are disrupted by radicals. We are denied renting the buildings. What does it mean? It means that we are on the right way. We cannot be stopped. There are hundreds of thousands of us all over Ukraine. Hundreds of thousands of voices are in unison today: everyone or no one should pay!”. The “Uspishna Kraina” reminded that the next forum would be carried out in Sumy on June 15. In addition, everyone can take part in discussion and development of the Tax Code or get online consultation from tax experts of the party on special internet-portal http://platyatvsiaboneplatytnikhto.com/ru/novyy-podatkovyy-kodeks.